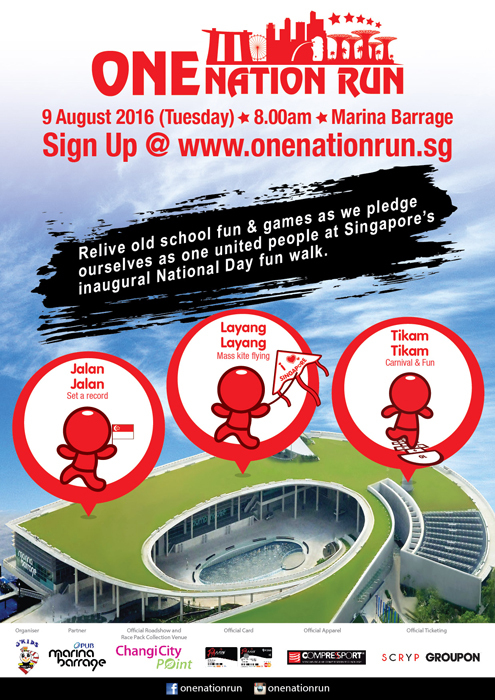 Celebrate the nation’s 51st milestone with the inaugural One Nation Run 2016 this year. The One Nation Run 2016 puts together a fun and memorable experience as we pledge ourselves as one united people. Elements of Singapore-inspired icons and symbols will be injected for a reminiscence of the heritage and cultural roots of the locals. Jalan Jalan for a casual run along the Marina Barrage right through to Gardens By The Bay with your family. After which you can enjoy the breeze and Layang Layang your kites in a Mass Kite Flying on the Green Roof of Marina Barrage. Relive the good old kampong days with old-school games in the Tikam Tikam and Carnival activities! One Nation Run 2016 will set your hearts racing as the most number of participants will be running with a Singapore flag, setting a new record in the Singapore Book of Records! Copyright © 2008 - 2019 EverydaySingapore.com - Find, Discover, Share and Promote Happenings and Events in Singapore.